Shane Cotton is a key member of a generation of contemporary Maori artists who have explored their heritage in uncompromisingly contemporary fashion. Trained in a Western painting tradition at the Canterbury School of Fine Arts in Christchurch, Cotton came to the fore in the early 1990s as a contemporary ‘history painter’, combining images from New Zealand’s colonial past and bicultural present in beautifully crafted, sepia-toned and often ironically barbed paintings. Through the 2000s, Cotton’s paintings grew larger and also more complicated in the ‘messages’ they transmitted, alluding to an array of contested narratives, from migration, colonisation and resistance to religion, identity and war. 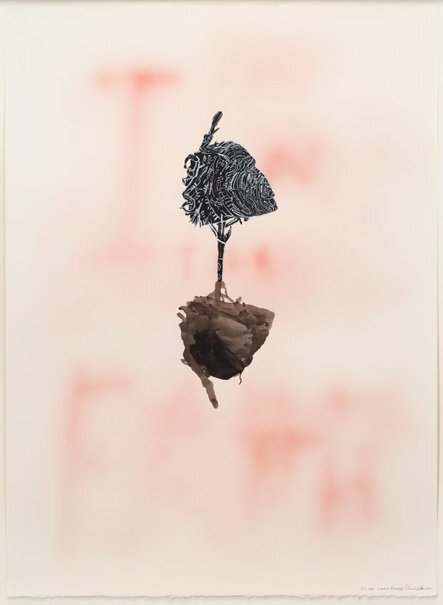 The work was first displayed at Cotton’s 2010 solo exhibition Smashed myth at Anna Schwartz Gallery alongside a number of other works on paper which depicted similar exquisitely detailed imagery -- from tattooed heads and human skulls to swooping birds and delicate botanicals. In each of the works, these ‘unrooted’ motifs, with their confusing spatial orientation and ambiguous relation to one another, appear beholden to an invisible network of forces, momentarily held still within an unfolding state of clamour and commotion. This sense of conflict and anxiety is heightened by the bloodied haze of words and symbols that fill the otherwise spacious compositions and against which his distinctive imagery is suspended. With its singular striking image, ‘In the Earth (study)’ 2010 can be described as having a quiet intensity. Nonetheless, its sense of tension and intrigue remain paramount. The work depicts a tattooed head, propped atop a stake that extends upwards from a shadowy mirrored form, suggestive of a small clump of earth. No longer affixed to the ground, it hovers in the centre of the painting, all but a lonely island in a large voided realm. Its precarious state of balance is captivating. It is difficult to reconcile the apparent weight and solidness of the ‘island’, conveyed in both its dark tones and detailed depiction, with the emptiness of the surrounding expanse. Demonstrating Cotton’s exceptional ability to make paintings that exist on the very cusp between the present and coming moment, the work is full of tense anticipation. We cannot be sure whether the ‘island’ will remain suspended, held in a state of zero-gravity, or whether this might be the very moment before those forces break, sending it plummeting back down to its earthly origins. Behind the image, we can faintly make out the letters spelling the words ‘In the Earth’ with Cotton, once again, leaving his work open to multiple readings: are these words emerging and about to sharpen into view or are they slowly seeping into the paper and about to disappear? Signed and dated l.r. corner, pencil "... Shane Cotton 2010."